" ...the lead guitarist who hates to solo, the trombonist playing percussion, the singer who just shouts. We are hatred, we are joy, we are noise for the sake of noise. We are Not Right." 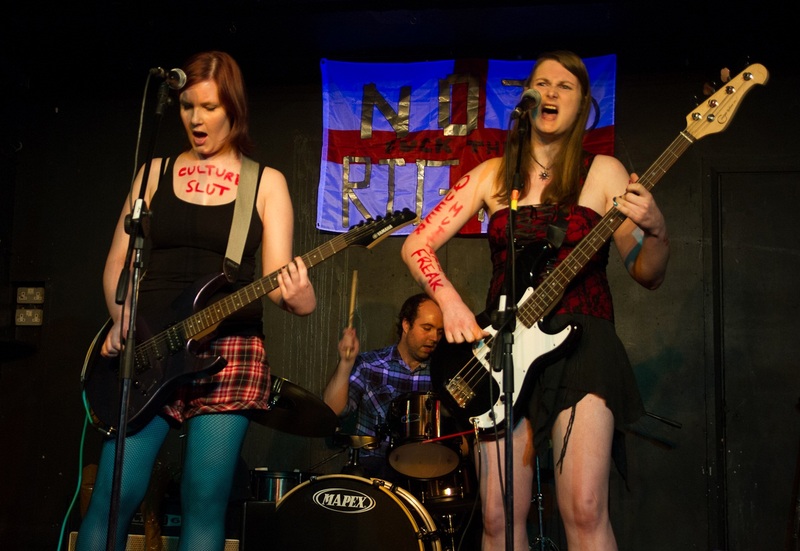 "We are: punk rock attitude, riot grrrl aesthetic, queer feminist rage, the politic of people before profit." Which descriptions, of course, mean that they were sure to find favour here at the Streetlamp. But, to be honest, the real reason they made an impression, among the hundreds of new tracks we listen to each month, was the tone of the lead singer's voice. You see, back in 1981, John Peel championed a late-to-the-party punk band from Stanwell in Middlesex by the name of !Action Pact! (that's right, with prefix and suffix exclamation points for added emphasis). Anyway, the group had contributed two tracks, 'London Bouncers' and 'All Purpose Action Footwear', to the Heathrow Touchdown EP, which John was most excited about. He played the songs many times throughout that year and eventually asked the band to record their first session, which they did in February 1982; recording the tracks 'People', 'Suicide Bag', 'Mindless Aggression', 'Losers', and 'Cowslick Blues'. The resulting demo tape caught the attention of the fledgling label Fall Out Records, which signed the band as the first act on its roster. !Action Pact! 's label debut, the Suicide Bag EP, was released in July 1982. "sounding like a bad-tempered switchboard operator." While it isn't quite how I would have put it, I will acknowledge that George's shrieking vocals tended to polarise opinion. You either loved them or hated them - I, personally, loved them and went straight out and bought the EP. Interestingly, at that time, the more progressive thinkers of the punk movement had morphed into the post-punk movement and left the field of 'traditional punk' clear to an element that had always existed at the margins of punk. This element was the boorish, macho, Sham 69 type punk who left to their own musical and artistic devices ran straight up the cultural cul-de-sac that was the Oi! movement, where they flirted dangerously with thuggish, fascist imagery before, thankfully, fading away in a cloud of disinterest. Anyway, I still recall that my championing of !Action Pact! at that time brought a few sniggers and sneers from some of these types, as the idea of a punk band being fronted by a shrieking 'bird' who wasn't just there to be leered at was seen as threatening to the lad's club mentality of the Oi! music era. Suffice to say it just made me like them even more. If you want to know more about the band, they have a very good website 'here'. When you visit please check out their free online zine, which contains some excellent material. Ruth also has an interesting wordpress blog 'here'. Please check the band's facebook page for upcoming gigs. This track was played as song number 48 in John Peel's Festive 50 for 1982. A free MP3 of this track can be found 'here'.